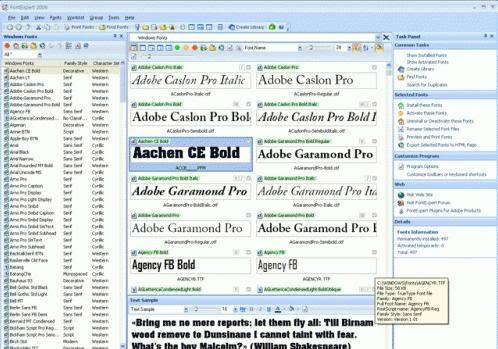 FontExpert 2009 enables you to preview and manage both installed and uninstalled typefaces, plus examine your system for font errors. You can display the list of installed font faces, customizable font samples and advanced font properties. * Print Fonts. FontExpert 2009 can print selected fonts. It is easy to print character map, "water flow" or face name reports for selected fonts, either installed or uninstalled. You can customize and format page headers and footers as desired, for example, by adding the name of your company.